During my recent forays into web development I'm learning about using other fonts. It seems that Web Open Font Format (WOFF) may be the way to incorporate a font on a web page. Existing TrueType/OpenType fonts can be converted to WOFF with these programs. Arch Linux users can install these programs using my AUR package. 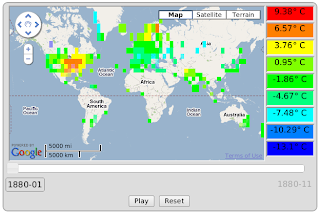 My first project with Google App Engine was a Google Map that displayed temperature data for a given date. I used monthly grid data provided by NOAA. With this data the Earth is divided up into 5x5 degree grids for a total of 2592 grids. I wrote a simple Perl script to parse the NOAA data, find the min and max temperatures, generalize each temperature point into a scale of 1 (min) to 9 (max), calculate the latitude and longitude for each corner of the grid, and write a CSV file suitable for upload to the datastore. For the backend I wrote a Python script that created a kml of the data for the requested date. In the kml, each temperature range is a separate Placemark, and within each Placemark are GPolygons representing the grid data.